We are getting a new phone system! In addition to helping us serve our clients more efficiently, it will also change our outbound Caller I.D. display. Please add (800) 687-0668 to your contact list as Aprotex. This is the number the central station will be calling you from. Aprotex has been a forerunner in the security and detection industry since 1952 and continues to operate at the leading edge of current technology. We were the first alarm service company in Texas to utilize radio telemetry to transmit alarm signals, a technology widely acclaimed today as the ultimate in state of the art security. Our services include the installation, service, and repair of burglar alarms, fire alarms, card access control systems, closed circuit television, and long range radio alarms. Systems can be designed for residential, commercial, or industrial installations. 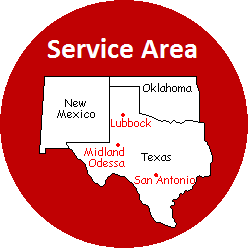 With fully staffed offices located in Midland, Lubbock and San Antonio, Aprotex provides sales, installation and service to most of the great state of Texas and is licensed in New Mexico and Oklahoma as well. Customers located in Arkansas, Kansas, Missouri and Mississippi can call on our friends at Guard Tronic for their security needs. Read more about Aprotex & Guard Tronic. With Aprotex, one number does it all. When you call (432) 570-0188, you immediately speak to an actual person, not a machine, and we can help you with whatever problem or concern you may have. With one number to call we can meet any electronic security need you may have, whether it be monitoring installation, service, repair, or inspection requirements. All Trademarks used by permission. Aprotex and the Aprotex Logo are copyrighted © 2018 Aprotex Corporation. All Rights Reserved.